Authored Novels: "Selina Mae Steele" and "Grass IS Green ... But Beyond Reach." Posted: Wednesday, November 19, 2014 6:30 am | Updated: 7:11 am, Thu Nov 20, 2014. MOUNT LAUREL — A short distance from a bustling shopping center, where bargain–seekers search for an edge in the annual pre-holiday marathon, there is an oasis of calm. It is Studio A at the YMCA of Burlington and Camden Counties on Centerton Road. There, every Monday morning, Sylvia Rawlins, known to friends, colleagues and students as “Silky Stone,’’ gathers her pupils for a 90-minute session of tai chi. For that one-and-a-half-hours, only deep breathing and slow movement matter. 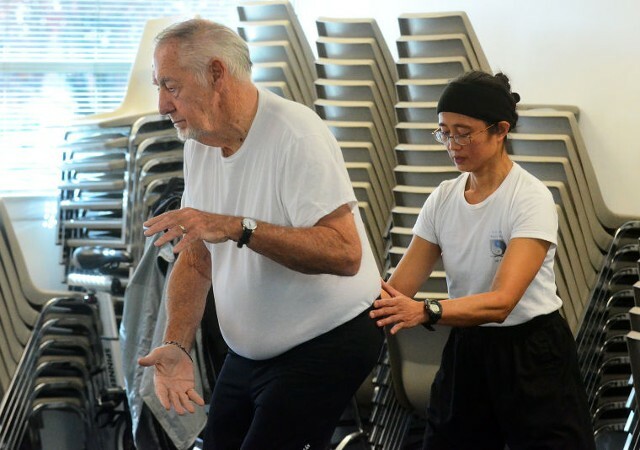 The class participants, mostly seniors, have left stress and minor aches and pains behind, to take in the benefits of an ancient Chinese practice that many Asians accept as a natural part of their lives and is slowly becoming better known and more appreciated in this country. “In China, whole families do it together before breakfast. It’s a normal part of the day and children grow up accepting it,’’ said Rawlins, who was born in the Philippines 52 years ago and came to the United States in 2002. “I met a guy,’’ she said, by way of explanation. They are now married and live in Westampton with their son. A martial arts artist, body-builder, author, actress and personal trainer, the instructor said that deep breathing is central to the practice of tai chi. “It is the main control for everything,’’ she said. Her professional name was chosen in part to reflect the two sides of tai chi, soft and fluid, on the one hand, strong and focused on the other. “That’s why I chose Silky Stone,’’ she said, noting that tai chi is closely related to martial arts. “As we age, we aim for a softer approach, one that the young may find too slow or boring,’’ Rawlins said, listing some of tai chi’s many benefits, improved balance and flexibility, reduced inflammation, lower blood pressure and deeper sleep, among them. 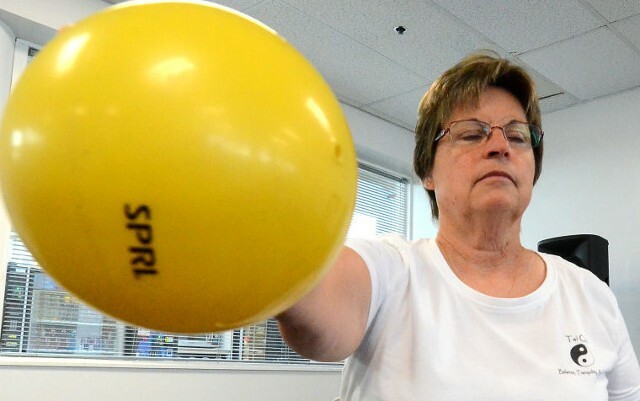 A swimmer with chronic back pain, Cecilia Penna, 60, also joined the class two years ago and has noticed a lessening of tension. “The deep breathing has really helped,’’ the Mount Laurel resident said. A relative newcomer, Evesham’s Joe Speight, 76, started the class seven weeks ago and noticed a difference in how he felt the first day, a reaction that does not surprise the instructor. The class is part of the Y’s group exercise program and, according to Jessica Revere, Marketing and Communications Manager, will be free to members until the end of the current session in mid-December. Sylvia Rawlins, known to friends, colleagues and students as “Silky Stone,’’ teaches tai chi at the YMCA of Burlington and Camden Counties in Mount Laurel. The stretching portion of Sylvia Rawlins' tai chi class at the YMCA of Burlington and Camden Counties in Mount Laurel. Behind her are students Art Baumann of Mansfield (from left), Joe Speight of Evesham and Cecilia Penna of Mount Laurel. The instructor concentrates on her breathing. 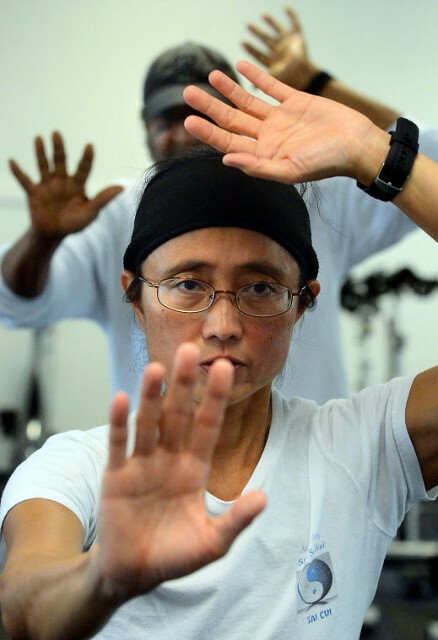 Cecilia Penna of Mount Laurel concentrates on her breathing during the tai chi warm-up exercises. Sylvia Rawlins checks the flexibility of student Art Baumann's hips during the class. A martial arts artist, body-builder, author, actress and personal trainer, the instructor said that deep breathing is central to the practice of tai chi. 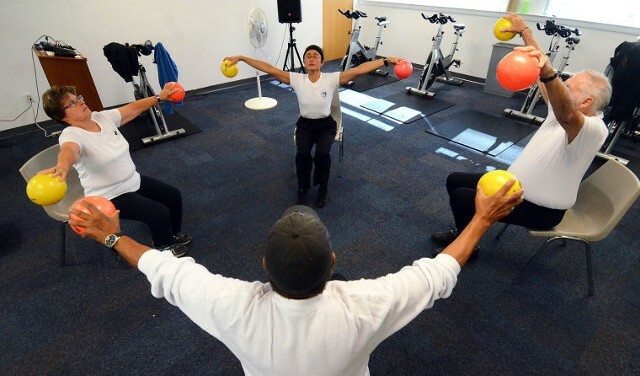 Tai chi instructor Sylvia Rawlins (center) of Westamton starts her class with a warm-up exercise using balls.